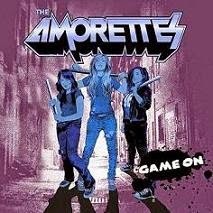 RockUnitedReviews: The AMORETTES: "Game On"
Promoted with the slogan: 'the arse-kickin' Scottish power rock trio', these lassies are comin' at ya' with the gritty punky hard rock attitude and baseball bats (see cover pic). Brought up with the real Taggart and the sheer frustration of being force-fed with deep-fried Mars bars and haggis, the three of Gill Montgomery (vocals/guitar) and the McKay sisters (Heather - bass. Hannah - drums) are determined to break on through to the other side of the highlands. Produced, mixed and mastered by Chris Tsangarides (Judas Priest, Thin Lizzy, Depeche Mode, etc.) at the Ecology Room Studios in Kent, "Game On" kicks like a mule to the head with meaty bass lines, mega crunchy guitar riffs, thunderous drums, and the mad aggressive vocal performance by Gill. She's like a pissed version of Lita Ford met Johnny Rotten and the result works like a clockwork. She's just one of those singers that you instantly believe in since every word is aimed directly at your soft spot. The music could just as easily have been recorded in 1983 and it's bits and piece of everything from Girlschool to Lita Ford (her debut album), Joan Jett, to Motörhead and any decent U.K. post-punk platter. It's just fun and games, no gimmick, or the brain dead sexist image approach of any MTV female act of the past twenty years or more. It's pure and honest rock the way it should be and you can't help to shout along to the lines of rock me roll me or why not hot and heavy. The hey-hey power chanting of "Get What's Coming" takes the wicked approach of a night out with Joan Jett and the Young brothers (Acca Dacca). They're heading out on tour at this very moment with Europe and Black Star Riders and I actually feel sorry for the geezers. These three are going to "Give 'Em Hell" with their sing-a-long melodies and attitude. Recommended.